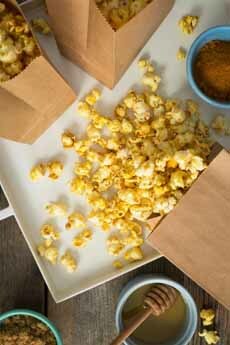  You can use brown bags to serve popcorn, but not to pop it (photo courtesy The Popcorn Board). Having unpopped kernels at the end of popping is normal (photo courtesy Belle Chevre | Facebook). 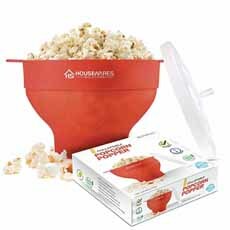 Ditch the brown bag and get an inexpensive microwave popcorn popper or similar vented bowl (photo courtesy Housewares Solutions). 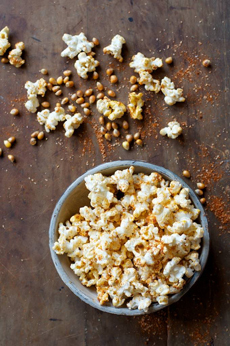 Do you pop popcorn at home? Today’s tip is a safety message from The Popcorn Board about brown-bag popping, something that many of us home poppers have done. “Despite what well-intentioned food, lifestyle or health promoters tell you (writers, bloggers, TV personalities, etc. ), it’s NOT OK to use a brown paper bag in the microwave oven. Heating releases these volatiles, which can be harmful if inhaled repeatedly over time (see below). There has been extensive research and resources that have gone into the development of microwave popcorn bags to ensure the product is safe for consumption. Volatile organic compounds are chemicals that cause large numbers of molecules to evaporate and enter the surrounding air, a trait known as volatility. Diacetyl is a volatile compound, a flavoring ingredient formerly used in foods like popcorn, caramel and dairy products. It evaporated into the air when microwaved popcorn bags were opened. More than 10 years ago, it was found that workers at a factory that packaged microwave popcorn developed bronchiolitis obliterans, informally known as “popcorn lung,” at a higher incidence than other people. It’s a condition that damages the lungs’ smallest airways and leads to coughing and shortness of breath. In 2007, popcorn manufacturers removed diacetyl from their products. Microwave popcorn does not contain diacetyl today. But there are other volatiles that are released when microwaving popcorn in brown paper bags. So, ditch the brown bags for the microwave—for popcorn or anything else. If you want to pop your own kernels, do so on the stovetop. There are countertop air poppers, if you make lots of popcorn; and microwave popcorn bowls (photo #3) that can be used to cook/heat anything else in the microwave. When you make any popcorn, whether stovetop or microwave, you need to stay close to it to listen to the kernels as they pop. When they stop popping, immediately stop the heat, or the popcorn will burn. It’s normal to have unpopped kernels at the bottom. Better unpopped than burnt! 1. PLACE 2 tablespoons of popcorn kernels in one layer on the bottom of a deep pot. Cover with a tight lid and turn the heat to medium. 2. SHAKE the pot gently every 20-30 seconds. Once the kernels start popping, shake the pot every 5-10 seconds. 3. LISTEN. At the beginning the popcorn will pop vigorously. When there is a second or two between the popping sounds, turn off the heat. 4. LET the popcorn cool for a few minutes and move it to a serving bowl. If you want to add seasoning (salt, herbs, spices), mix it into the warm popcorn in the pot.